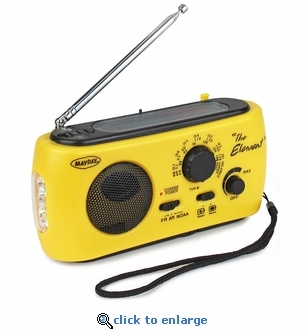 The Element emergency radio and flashlight combines versatility with a convenient size for disaster and emergency preparedness. This Am/FM weather alert radio with LED flashlight can run from 6 power sources: solar, dynamo crank power, AAA rechargeable or regular batteries, AC adapter (not included), or USB power from a computer or any 5V power source. This emergency radio is perfect for home, work and travel and small enough to take hiking, camping or included in your emergency preparedness kits.